Let's start of saying I'm not the biggest fan of the new 3D animated movies. As far as I'm concerned they have torn out the soul and replaced it with cheap slapstick kiddie humour - compared to the old 2d Disney classics. Anyway my friends know this and one of them gave me a handful of 'good' animated movies for me to check out. One of them was Hoodwinked. The plot is a classic crime story told from various perspectives, which works great. Some of the characters are brilliant and the subtle humour here and there is spot on. Some people have complained about the animation quality or style. That is just pure nonsense. Having recently seen Up! (yes..I hoped it would be more than your generic Pixar movie...) I don't see how that movie benefits from having a much larger budget. I think the voice acting is way more important than anything else. 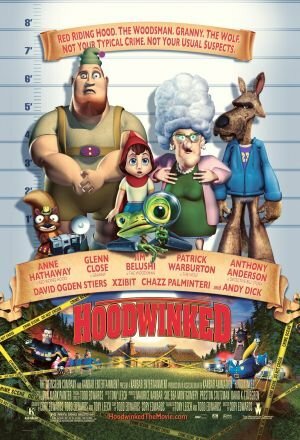 This is where Hoodwinked is amazing. Some of the voice acting is brilliant. I give it +1 for Anne Hathaway alone. Red with the big doe eyes and Hathaway's sweet sweet voice is amazing! Also John Belushi as Wolf is great as well as the rest of the cast. Also do not underestimate the Arnie references!